I think anime shows about ninja usually aren't all that great. Why? Well, for the same reason I think that the high school setting for anime shows are insanely overdone: They just freakin' are. Just about every other anime has a bunch of high school kids in it. Even Dragonball Z has a segment that has the "high school" thing going on a for a bit. Evangelion, Escaflowne, Rumbling Hearts, Girls Bravo, InuYasha, Code Geass, and on and on and on. Trust me, high school ain't that interesting! I went there. It kinda sucked. Anyway, I'm going to abandon that particular subject and get back to ninjas. I think the one thing that really irked me was Naruto. Yeah, it's an okay show, but it's one that followed the path of Dragonball Z and Bleach and went on for freaking ever. A lot of kids liked it much the same way I loved Dragonball Z when I first saw it although I did stop liking it as much once Majin Buu got involved: fat or not, pink villains just aren't cool. But I remember Toonami showing Naruto all the time before it went belly-up and I've had a bad taste in my mouth ever since. Naturally, Toonami is playing it again. Some folks never learn. 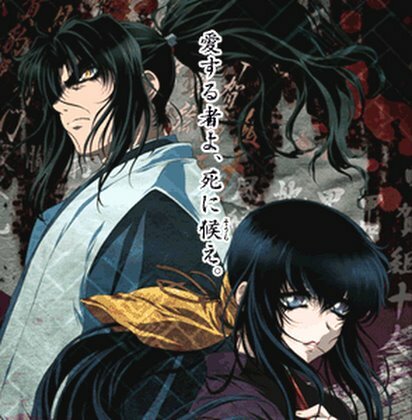 So had I known that Basilisk was going to be a show about ninjas (with superpowers, of course) then I might not have bought it. But what did have me interested was the Shakespearean plot of the show. In high school, I really liked Shakespeare and I wrote my own little word doodles that kind of mimicked Shakespeare's sonnets. My pseudo-sonnets all sucked, but they killed some time and helped spread the wings of my imagination a bit. Basilisk is a lot like that. It starts off as a conglomerate of fight scenes between some spider-looking guy and some other long-haired ninja dude. Then a lot of other guys fight while our two main characters remain sort of ignorant of the fighting and do their whole "two lovebirds" bit. But once our main characters are made aware of the bloodshed... that's when the show takes off as far as I'm concerned. It's the meat and all of the build-up was just a fatty appetizer. Our two main characters are Oboro of the Iga clan and Gennosuke of the Kouga clan. These two serve as our Romeo and Juliet of the the story while the Iga and Kouga clans serve as our Montagues and Capulets. The Iga and Kouga clans had been at war for a long time, but a cease-fire was finally enforced by Hattori Hanzo the 1st to prevent further bloodshed in the early 16th century. The two clans were forced to serve the Shogun Tokugawa Ieyasu as a result of this pact. Thus making any act of violence toward the other clan a treasonous act. But when it is time for Ieyasu to step down, a dispute as to who is his rightful heir ensues. Of course, it does. So Ieyasu decides to do away with the no hostilities pact and have the Kouga and Iga duke it out to decide which of Ieyasu's grandsons will become the undisputed heir to the Shogunate. Ten ninjas from each clan are written on a list and these lists contain the ninjas who must be killed in order for the competition to be won. The winning clan will gain favor from the Shogun for a thousand years. But Gennosuke and Oboro are in love and they were originally betrothed with hopes that a union between the two could stop the deep-seated hatred between the two clans. Now, with the leaders of their clans dead by each others hands, Oboro and Gennosuke must face a difficult future in which their clans are back to killing each other and they are the ones who must now lead the charge. Naturally, there's a bunch of action, too. It wouldn't be much of a ninja anime if there wasn't fighting. But this show is primarily a drama and a romance. The show is very flashback prone as well. They aren't useless flashbacks, but they do happen at slightly inopportune times. Characters who died in the first few episodes have a way of re-appearing much later on in the series. Even characters who were initially just there to prove that there were ten names on each scroll get a bit more screen time after they've already bitten the dust. So it is kinda awkward to watch at times because it seems you only know more of the characters after they're dead and that makes it difficult to really connect with them... since they're already dead at this point and have been for a few episodes. And there are almost as many "main" characters as there are episodes so a lot characterization is really squeezed in even if it is in a backwards kind of way. A few characters just don't get much time because they killed so quickly, though. It's difficult to remember who killed who because the one guy who killed this other guy gets killed in the next five minutes by some other guy. It's a lot to digest for a show that is just 24 episodes. But, this slight roadblock aside, I think the show is worth it. It is a bit dense, but it's very much worth it. The bad guy has the coolest ability of them all and he is so easy to hate. Our two main characters are very sympathetic and I think their plight would do the bard proud.